What’s in McGill’s giant brownie? What measures 30x15 feet, tops the scale at a gut-busting 3,500 pounds and is chock full of Fair Trade goodness? Student Housing and Hospitality Services gigantic brownie, that's what. What to sample the behemoth brownie? Bring your sweet tooth to lower campus on Aug. 26. De Volpi’s culinary talent has brought him to lead some of Quebec’s finest cuisines such as the Casino de Montréal and Casino du Lac Leamy, the Queen Elizabeth and the Place d’Armes hotels. So why is he losing sleep over brownies? 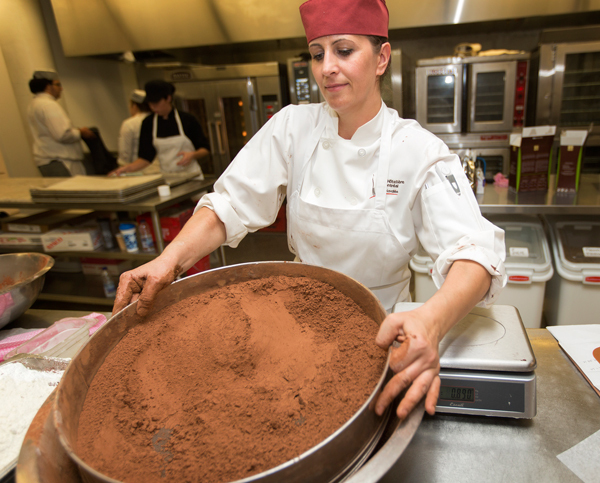 It’s more the scope than the actual meal, as De Volpi and the Student Housing and Hospitality Services (SHHS) team is responsible for cooking and assembling the world’s largest brownie that, once finished, will measure 30×15 feet and top the scale at a gut-busting 3,500 pounds. But the SHHS people aren’t new at preparing a mega meal. 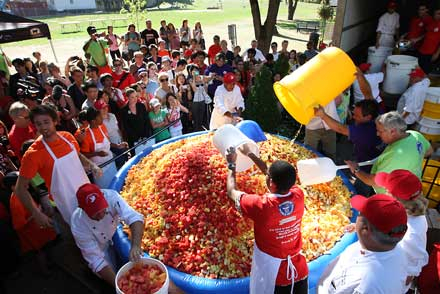 In 2012, they shattered the Guinness World Record for largest fruit salad, by making an 11,197-pound mountain of freshly cut fruit. Last year, the team hosted the Tomato Fest in which thousands of people dined on a five-course tomato-themed meal that included salsa, gazpacho, Greek salad, pizza with fresh tomato sauce and a 500-pound tomato cake. Huge food aside, what makes this year’s event different is that it is doubling as a food fair. 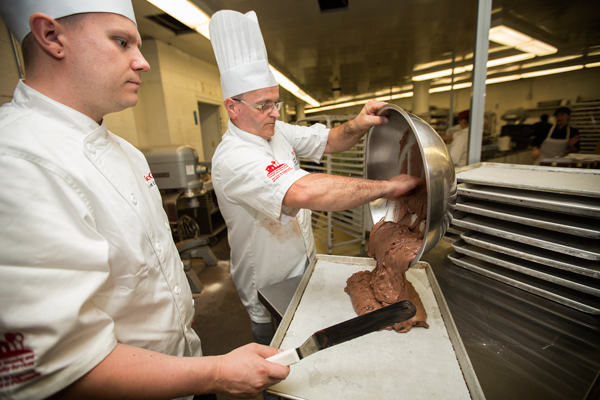 In all, 27 food kiosks from corporate vendors with whom McGill partners will share the tent with the massive brownie, including Première Moisson, Van Houtte Coffee, Coca-Cola, St-Viateur Bagel and Danone Yogurts. Many vendors will give away free samples of their produce. On top of the 8,400+ eggs, the brownie will take 1,440 pounds of Fair Trade sugar, 720 pounds of margarine, 540 pounds of Quebec-grown and milled flour, 360 pounds of Fair Trade cacao powder, 16 pounds of baking powder and 420 pounds of organic Fair Trade dark chocolate. In the end, it will produce some 19,000 portions. 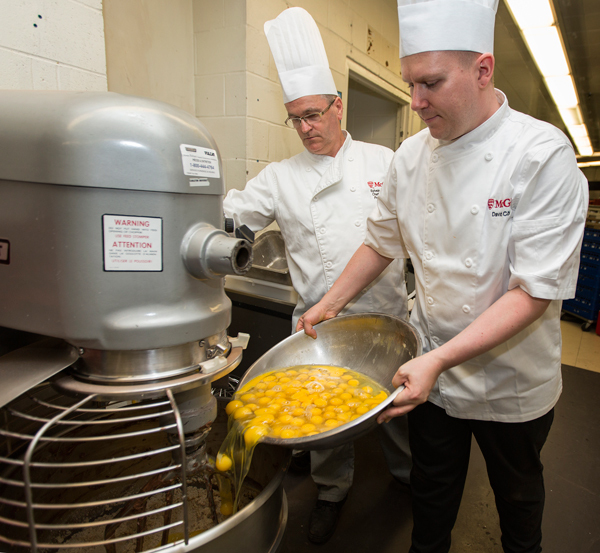 Because of its size, the brownie has to be cooked in stages over a number of days at various kitchens on campus. At noon on the day of the event, the trays of brownies will be brought to the tent on lower campus, assembled and iced. At 3:30, Principal Suzanne Fortier is expected cut the first portion and the rest of the brownie will be served to the public.